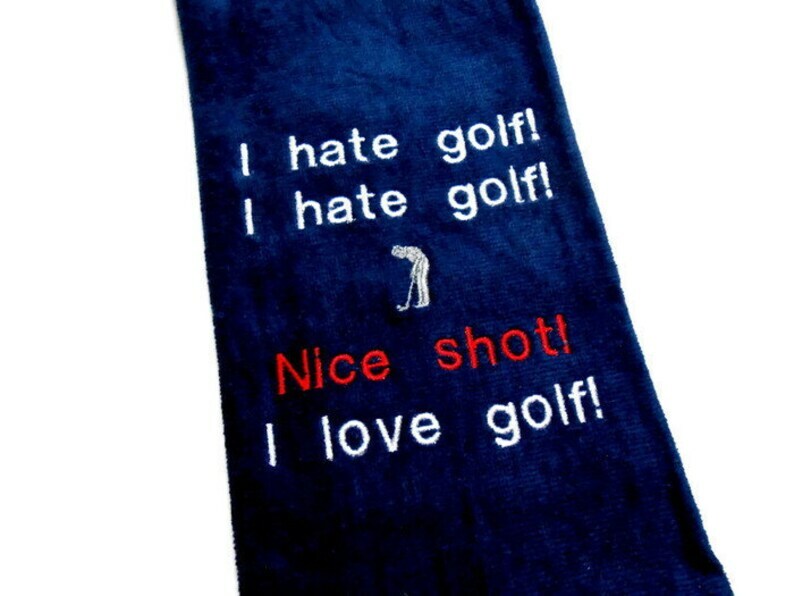 Golf sports towel. This all cotton velour golf towel is a great birthday, Father's Day, groomsman, or retirement gift for the golfer. Premium quality golf towel made of 100 percent premium cotton with plush velour finish. There is a funny saying embroidered on this large sized towel. I hate golf! I hate golf! Nice shot! I love golf! There is a silhouette of a golfer in the center. The design measures approximately 5 X 4 inches. This tri fold, 100 percent cotton terry, 2-ply yarn velour golf towel is shown here in navy blue. This is the best!!! I’m so happy!! They even wrote his firefighter number!!! Love! !